I want to start this blog by saying, I hope everyone had a wonderful Christmas day!! 1. What's on your Christmas list? This year I didn't really have a wish list, my birthday is so close to Christmas (December 8th) so usually I join them into one. However this year, I'm going to Bali soon, so I pretty much asked for money, boring I know, but I need it. 2. What is on your Christmas day agenda? My Christmas day usually involves my family waking up and opening presents in the morning. We then head off to my mum's sisters house, where we catch up with all my family from my mum's side for a massive breakfast, with everything you could imagine. We then go to the beach or swim in the pool before having a late, light lunch. After we head to someones house on my dad's side of the family (it changes each year) for an early dinner. 3. How much Christmas shopping have you done? I must admit I was pretty slow with my Christmas shopping this year, however I did know what I was going to get everyone. I had all my Christmas shopping done about a week before Christmas. 4. What's been your biggest ever surprise gift? I don't have one really, each year there is that one present that is a massive surprise, so i can't really chose. 5. When do you usually put up your Christmas tree? We usually put our Christmas tree up on the 1st of December. 6. Do you have a special outfit planned for Christmas Day? I usually wait until Christmas morning to determine what I wear in case I get something for Christmas. However this year, I had already planned what I was wearing, as I had received a beautiful dress from my sister for my birthday. 7. Do you have any plans for Boxing Day? Boxing Day for my family, is a relaxing day, Dad watches the cricket, my sister and I put all our presents away, we swim in our pool, and eat leftovers. It may sound boring, but it is the best! 8. When did you stop believing in Father Christmas? I actually don't remember what age I was. There was always talk at Primary school, and because of that I started to believe that. It wasn't until I saw my Christmas stocking hiding in my parents bedroom, that I truly believed it. 9. What's your favourite Christmas scent? (Candle/Perfume? Well I can't go passed the smell of gingerbread cooking in the oven. But as for Candle/ Perfume, this year I am really loving the Golden Wonder Bath Ballistic from Lush, it has a beautiful sweet smell, and it being in the shape of a present makes it super cute. 10. 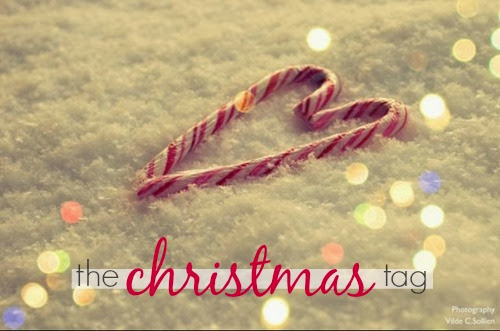 What do you love most about Christmas? There is not one thing I can pin point that I love most about Christmas, I just love it all. I love the massive lead up to Christmas, the carols, the decorations, the lights, the buying of presents, receiving presents, Christmas day, the food... absolutely EVERYTHING!! Sorry its after Christmas, but thanks for reading. If you have any suggestions please leave them below. Also I'm now on Bloglovin so feel free to check me out!